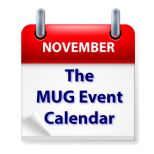 Two visits by Apple representatives highlight this week’s MUG Event Calendar. Apple Senior Systems Engineer Steve Zalot will speak to a Pennsylvania group, and Buddy Burke of The Apple Store will visit one California group. Alex Lane of Yelp will address another California group, and groups from coast to coast will focus on the latest version of macOS, Sierra. Other topics for the week include new MacBook Pros, Apple TV, Health apps, security, Siri and more than one holiday gift guide.